Term time has officially begun! Student Intern, Sophie, has some top tips for managing the pressures of a new academic year. Some students have been counting down the minutes until uni starts back, but others might be a little nervous. It can be difficult to leave home after a summer spent with family and old friends. Even if you’ve completed a year or two at university, it is still possible (and completely normal) to feel homesick. Homesickness is more than missing the people at home, you can feel homesick about losing the sense of familiarity of home, or that your family life is carrying on without you. If you’re feeling homesick, please check out our advice for managing these feelings. According to the Guardian some students can experience a ‘second year slump’ as their priorities change during their transition into a different year of study. This makes sense when you consider the added pressure to re-prioritise study over socialising. 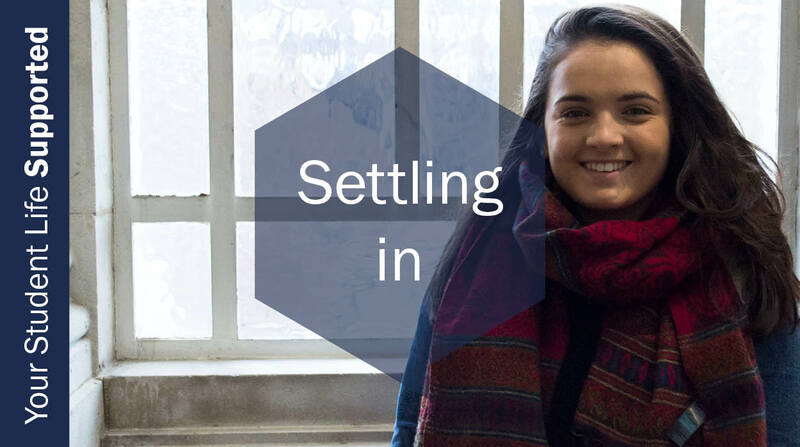 The first year of university is focused on settling in, finding your way round your new university and city. In the second and third years, it can feel like there is a shift in what is expected of you in seminars and lectures and even though you’ve been here before, it all seems somehow very different and new again. You might be asked about your plans for the future… What job do you want? Where will you live? Who will you live with? All this uncertainty and fretting about the future can lead to a drop in self-confidence and you might be feeling overwhelmed, which can have a negative impact on your wellbeing. But it doesn’t have to. Whether you are new to Higher Education, want to improve your grade or want to learn how to make your learning more efficient, Academic Study Skills classes could be perfect for you. Find out more about them here. Face-to-face appointments – A conversation with someone who is able to listen without any judgements or biases can be extremely beneficial if you are experiencing difficulties. This is a confidential place where you can talk through your emotions and think about your own solutions and strategies that can help with your problems. Online appointments – These can be suitable for you if for some reason you are away from campus (like during summer break), you are on placement abroad or somewhere else within the country or you just have commitments that don’t allow you to come for a face-to-face appointment during working hours. You can choose between email, webcam and instant messaging appointments. Once you request online support, your situation will be assessed and you will be advised on how to proceed and whether or not an online appointment is the best option for you. Wellbeing walk-in services – You don’t need to book in advance and you can just come along and have a 10-15 minute discussion with a member of the Wellbeing Team. They can offer advice, support and information, self-help materials, books and referrals for further support. This is an easy way of getting guidance if you are unsure how to act upon your issues. It is also a great way to get the time to talk through your thoughts with someone who is there to listen which can sometimes be the only thing we need to feel better. Workshops – These aim to offer information, support and self-help resources on a wide range of topics, such as Managing Social Anxiety, Dealing with Exam Anxieties, Striking the Balance and Dealing with Perfectionism. Workshops give students the chance to learn from each other and discuss coping strategies that they find useful. Courses and groups – Getting involved in a course or a group will give you the chance to develop new skills in a safe and supportive environment. Each small course of 5-12 students will be facilitated by one or two therapists who can explore different topics depending on the course. The groups are varied and range from peer support groups, Forces’ Veterans meet ups, long-term therapeutic groups or estranged students support groups. If you would like to be included in the monthly newsletter containing information for all upcoming courses, groups and workshops please email studentsupportworkshops@cardiff.ac.uk. Self-help resources – There is a lot of online content that can support you in a time of crisis. Wellbeing Central includes self-help resources that can signpost you or help you recognise and manage the symptoms of mental health problems. The self-help resources are ideal if you prefer working through your difficulties in your own time or if you would like some timely quick tips and strategies. Peer to peer support – Student Wellbeing Champions – Our Wellbeing Champions are students that promote wellbeing through campaigning, organising events and being a visible support to other students. They can offer a peer ear and advice at their events and can be of help by signposting you to different services. Urgent advice – If a situation arises where you or someone else needs urgent help or support, please be aware that there are many options open of you. Familiarise yourself with these and make sure you have at least some of these contacts safely kept in your wallet, phone or key chain in case you need them. If talking to a member of staff is something you are unsure about, why not chat to one of our Student Wellbeing Champions? They are trained student volunteers who can signpost you to support, offer you a peer ear and give you basic health and wellbeing advice. Find out more about them and how to get in touch with them here. If you would like to see our Champions in action, watch the video below! It might seem daunting, to focus on so much at one time. But take the time to plan ahead and believe in yourself. You’ll achieve much more by being your own best friend than by tearing yourself down. Don’t forget to spend time with your friends and take some time for yourself. Every new academic year is a matter of getting the right balance. Finding the balance can be difficult but don’t give up! You’ve made it this far!